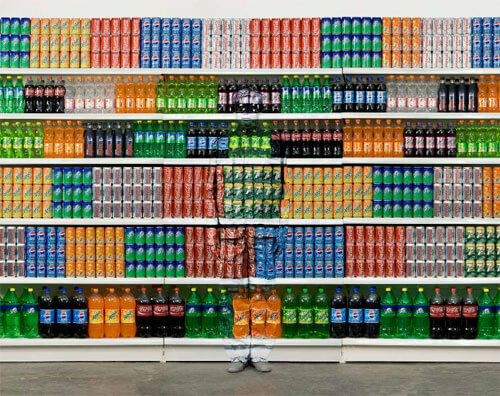 Liu Bolin is an artist born in China’s Shandong province in 1973, and he earned his Bachelor of Fine Arts from the Shandong College of Arts in 1995 and his Master of Fine Arts from the Central Academy of Fine Arts in Beijing in 2001. His work has been exhibited in museums around the world. 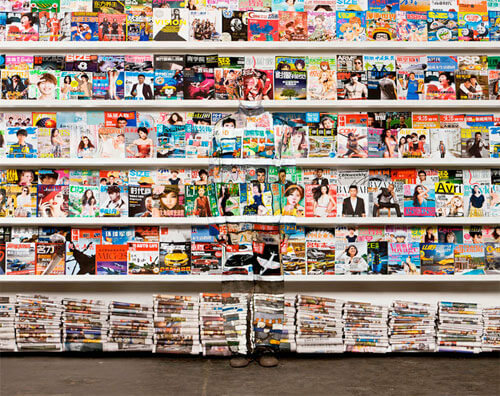 Also known as "The Invisible Man", Liu Bolin's most popular works are from his "Hiding in the City" series; photographic works that began as performance art in 2005. 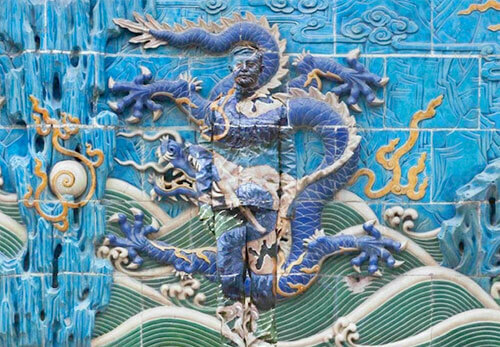 Liu belongs to the generation that came of age in the early 1990s, when China emerged from the rubble of the Cultural Revolution and was beginning to enjoy rapid economic growth and relative political stability. 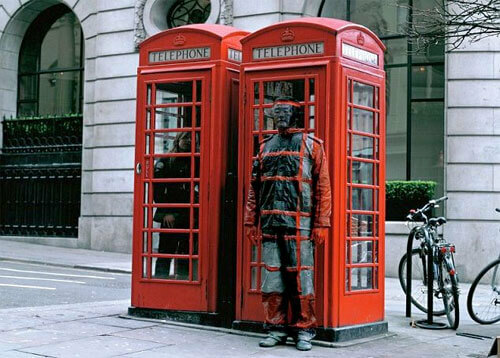 Since his first solo shows in Beijing in 1998, Liu Bolin’s work has received international recognition. 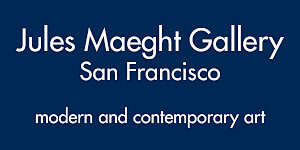 Among other international venues, his distinctive photographs and sculptures have been shown at the major contemporary photography festival Les Rencontres d'Arles and he had solo shows at Dashanzi Art Zone in Beijing (2007), Galerie Bertin-Toublanc in Paris (2007), Eli Klein Fine Art in New York (2008), Galerie Paris-Beijing in Paris and Brussels (2013), Boxart Gallery in Verona (2008), Forma Foundation for Photography in Milan (2010). To celebrate US President Obama's visit to China, he made an effigy of Obama in his honor. He now lives and works in Beijing, China. 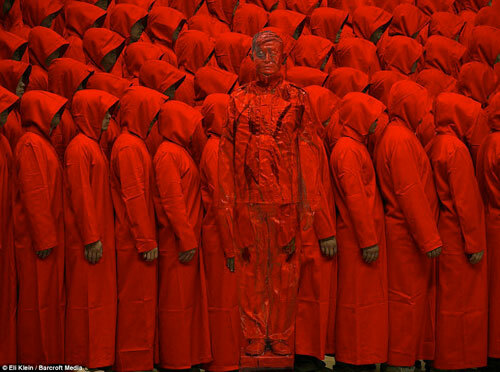 Born in 1973 in the northern province of Shandong, Liu Bolin trained at the prestigious Central Academy of Fine Arts, a student of the renowned artist Sui Jianguo, who mentored him at the beginning of his career. Liu belongs to the generation that came of age in the early 1990s, when China emerged from the rubble of the Cultural Revolution and was beginning to enjoy rapid economic growth and relative political stability. 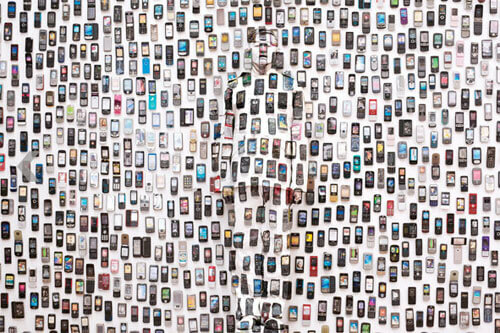 Liu Bolin is best known for his series of performance photography Hiding in the City. 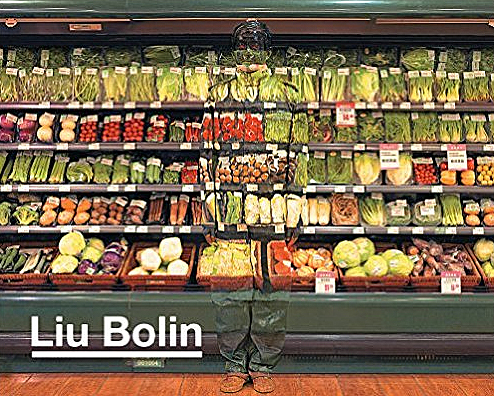 Since his first solo shows in Beijing in 1998, Liu Bolin’s work has received international recognition.  Among other international venues, his distinctive photographs and sculptures have been shown at the major contemporary photography festival Les Recontres d'Arles and he had solo shows at Dashanzi Art Zone in Beijing (2007), Galerie Bertin-Toublanc in Paris (2007), Eli Klein Fine Art in New York (2008), Boxart Gallery in Verona (2008/2010). He now lives and works in Beijing. Better known as The Invisible Man in media circles. 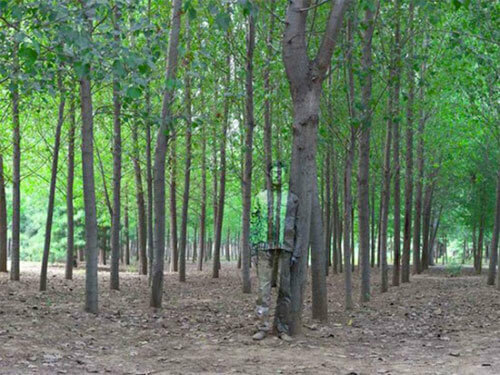 He discusses the social concerns of his home country through his artistic practice, most prominently through his ‘camouflage’ installations. 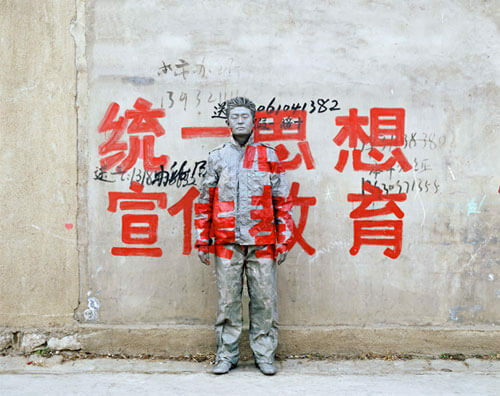 Traversing mediums such as performance, photography, Liu Bolin dissects the tense relationship between the individual and society by ‘disappearing’ into environments which are sites of contention and criticism. 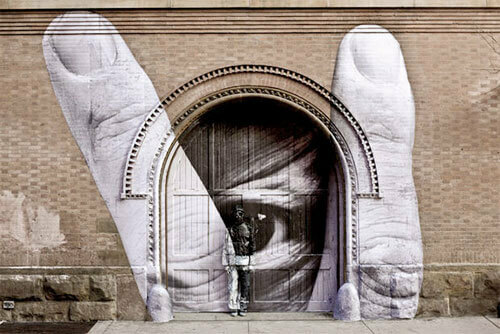 His “Hiding in the City” series has been displayed in numerous museums and institutions across the globe. 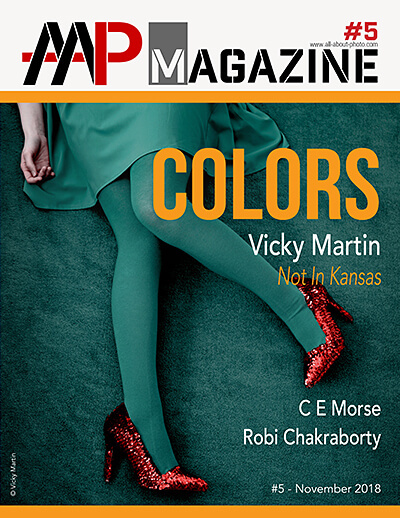 Inspired by his powerful visual messages, artists and institutions and organizations such The Louvre (Paris, France), Harper’s Bazaar Magazine, JR, Carlos Cruz-Diez, Jon Bon Jovi and Kenny Scharf have invited Liu Bolin to collaborate on creative projects. 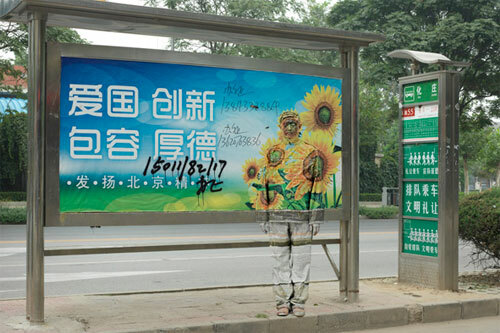 Liu Bolin first became invisible in 2006. 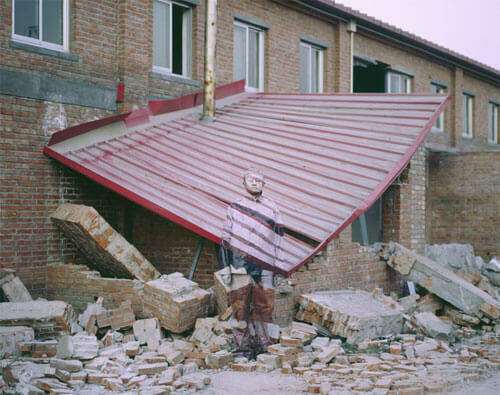 When the artist village in Beijing where he worked as a sculp­tor’s assistant was demolished, he decided to protest. 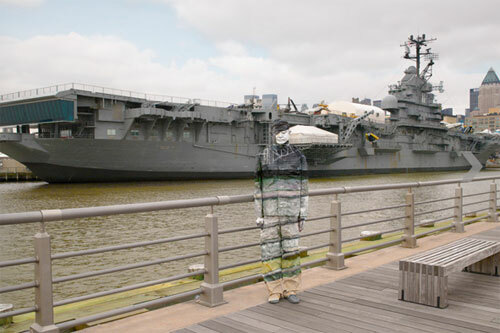 He camouflaged himself in the ruins with acrylic paints and photographed the finished product, marking the first of his Hiding in the City series. Since then, he has “disap­peared” in many different places around the world—from politically fraught areas in China to grocery stores, toy stores, and more. 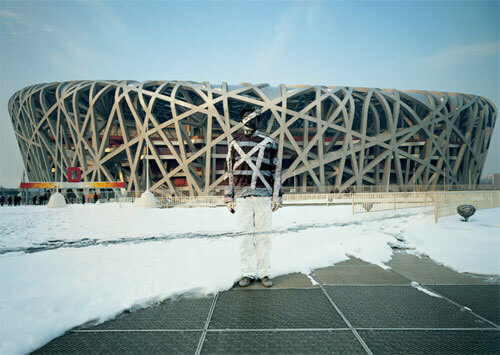 His work protests specific political acts of the Chinese government and offers commentary on consumer culture. 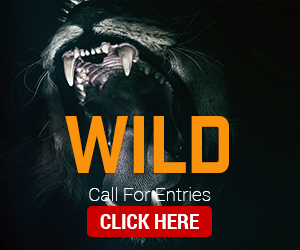 This comprehensive book showcases Bolin’s most striking photographs and sculptures and explores the techniques he uses to create his unforgettable art. Bolin has also helped other people disappear, including the members of Bon Jovi for the band’s recent album cover, as well as the fashion designers Jean Paul Gaultier, Missoni, Valentino, and more, and a selection of these photographs is featured throughout the book. 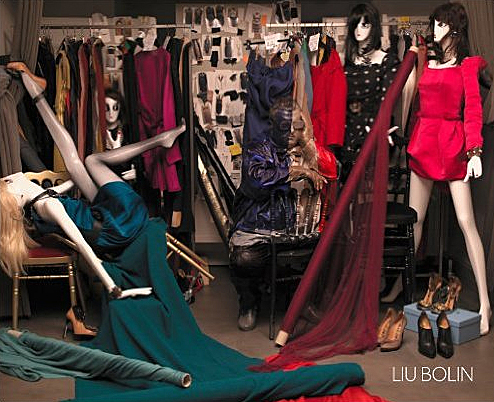 Liu Bolin is a chameleon. He covers himself with acrylic paints, blending in seamlessly with the landscape surrounding him and photographs the finished product. 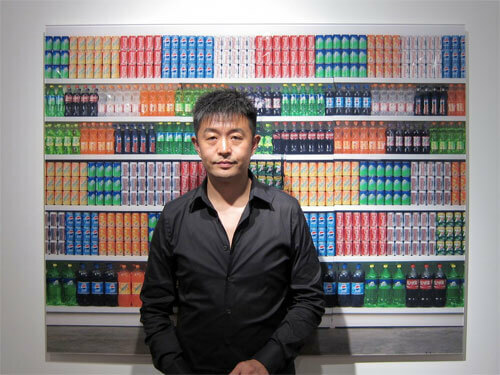 In his body of work called "Hiding in the City," he has disappeared in many different kinds of places around the world--from politically fraught areas in China to grocery stores, toy stores and more. Hiding becomes a strategy of visibility, a fight against censorship waged by a man who came of age in the China of the nineties, under the shadows of the Cultural Revolution. 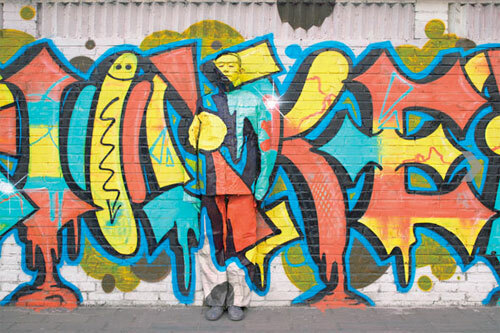 His work protests specific political acts and offers commentary on our consumer culture. 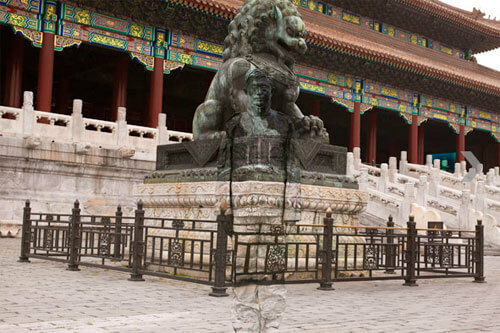 Through his unforgettable art, Liu Bolin highlights what is present, without creating any original forms or artifacts, but all the same powerfully revealing reality to the onlooker. This deluxe edition, packaged in a red Balacron clam-shell box, contains a signed print & an additional booklet. Limited Print. 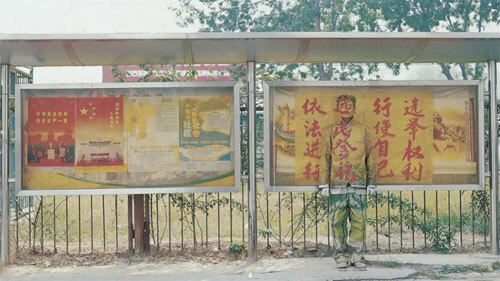 Published in conjunction with the exhibition "Liu Bolin Lost in Art" at Eli Klein Fine Art, in March 2012. 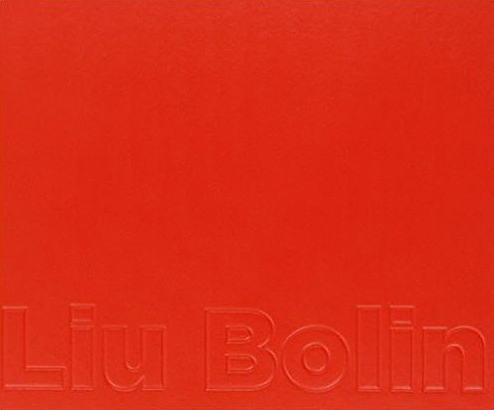 This hardcover book contains gorgeously reproduced images of Liu Bolin's most highly recognizable series. 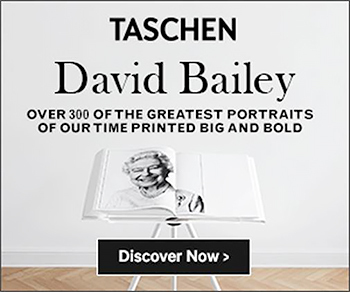 The book includes an essay by Michelle Marie Roy, curator of photography at Fotografiska Museum, Sweden, as well as texts from the artist about each of his four series of photographs in both English and Chinese.